Joshua Murdy received the Cadet Jonathan Briese Leadership Award. Moorestown Friends School class of 2016 alumni Joshua Murdy was one of four recently presented with the Cadet Jonathan Briese Leadership Award. Saturday, Sept. 29 marked the second full day of the annual Parents Weekend activities, at which 26 awards were presented to various members of the Corps of Cadets. Awards ranged from academic excellence in chemistry and physics, to most increased academic standing from freshman to junior year. As rising juniors at the United States Coast Guard Academy, all cadets contribute three weeks towards training the incoming class during which time, the juniors are referred to as Cadre. The Cadet Jonathan Briese Leadership Award is presented annually to four cadets who excelled in their demonstration of leadership during their Cadre Summer. The award is named in honor of Cadet Jonathan Briese, of Burke, Va., who died in February 2000, during his junior year at the academy as a result of an allergic reaction while undergoing a minor surgery. Briese was a member of both the Coast Guard Academy’s lacrosse team as well as the precision drill team. He was to serve aboard the U.S. Coast Guard Cutter Barque Eagle the next summer to train the rising sophomores. This summer, while serving as the Cadet Executive Officer aboard the Barque Eagle, Cadet Second-Class Joshua Murdy helped to oversee three week-long training sessions, resulting in the training of nearly 300 members of the Class of 2022. 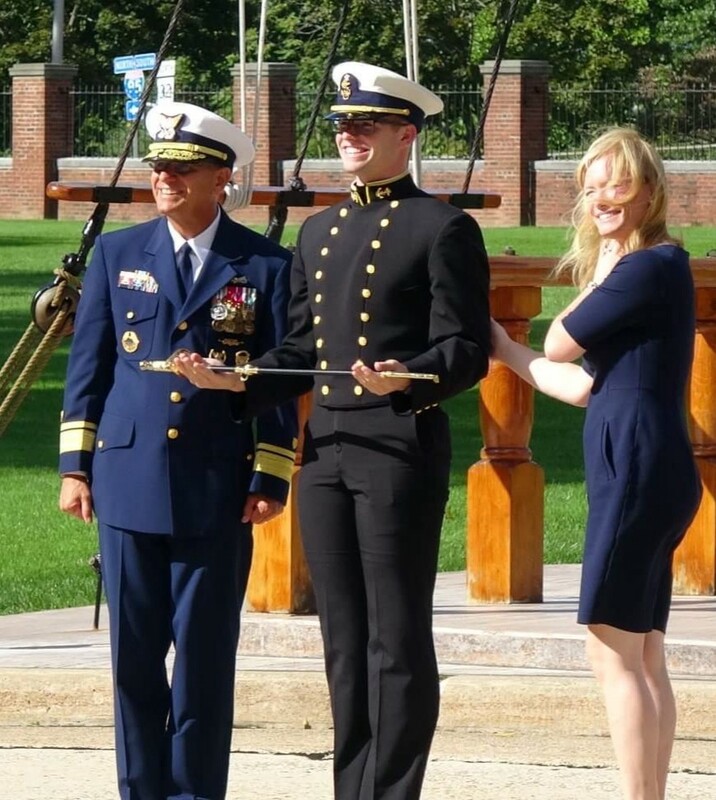 Murdy, a native of Hainesport, was presented with the Academy Swords by Sage Williams of the Coast Guard Foundations. The swords are used during weekly regimental reviews by all seniors at the academy, and cadets will retain their swords for future use as commissioned officers. Receiving the sword early is significant of an individual Cadet’s demonstrated and further potential for leadership within the Corps of Cadets.